So, the books left an impression. 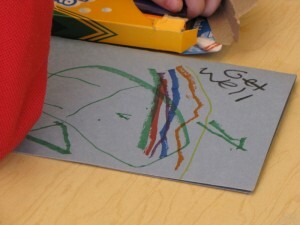 We made Bear some Get Well cards like this one above after reading Bear Feels Sick. I used finger puppets for the different animals he meets in Bear Snores On (I had to improvise some of them, I think I used my squirrel puppet for Badger). We talked about times we’ve been scared after reading Bear Feels Scared, and after Bear’s New Friend we talked about when we’ve made new friends. 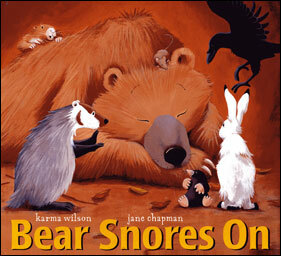 I used this worksheet from Karma Wilson’s site to ask the kids what they thought Bear would eat during all the different seasons (that was after reading Bear Wants More). For that same book I also printed out these photos to show them the different things that Bear ate. They had to try and remember one of the things, then I would show them the picture of what it looks like in real life. 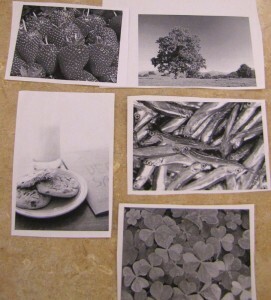 Strawberries, grass, cookies (they didn’t understand honey cakes), fish, and clover.